The first time that I had quail was at Ma Cuisine in Beaune, France. One of their wait staff helpfully translated the menu for us in real time as the combination of foreign language and hand-written menu proved indecipherable to Angela and me. I ordered the quail mainly because I had never had it before and their reputation implied that it would be good. And they truly managed to exceed my expectations that night. Quail is a more flavorful and slightly gamier version of turkey without turkey’s propensity to be overcooked and dry. The small size is both a blessing and a curse: it’s very easy to prepare exactly as much as is needed no matter the number of guests but it’s all significantly difficult to eat. Following the recommendation in the cookbook, we simply ate with our hands. This recipe is a bit different than the one that I had in France but it’s still quite good. The quail I had in France was larger than the quail I’ve found in the United States; in France, I was served a single quail as an entrée whereas in the U.S. two quail are usually more appropriate. However, if you aren’t particularly hungry or don’t want a lot of protein, a serving of a single quail would work quite well. Quail, simply by its nature, is not an every day food. It’s too exotic for that. 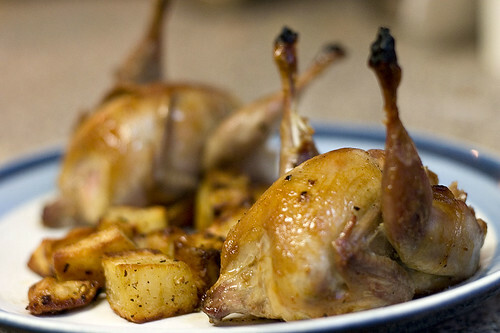 But, for a special occasion, quail can provide an elegant dinner. Twenty-four hours in advance, dry the quail with paper towels and then season all over with salt and pepper. Remove the thyme leaves from the sprigs and sprinkle the thyme leaves over the quail. Refrigerate for 24 hours. Dry the quail and remove any thyme remaining on the birds. Tie a string around the quail to keep the legs tucked back and pointed up. 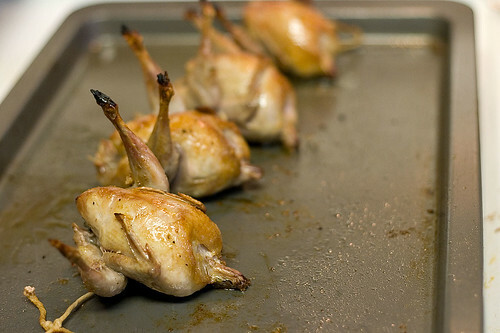 Place the quail breast side up on a shallow baking sheet and broil 4″ from the broiling element for 5 to 6 minutes or until the breasts are well browned. Turn the quail to one side and broil for 1 minute. Turn the quail onto the other side and broil for 1 more minute. Turn the quail breast side up and broil for 1 final minute. Remove from the broiler. Allow to rest briefly, then serve.